Have you considered a first-time contribution to a non-profit, but felt you should first “check out the numbers” or “do your homework” before making the gift? DonorsTrust clients often ask us our opinion about groups they are considering supporting. Conducting that due diligence is one of the benefits of working with us. If you’d ever like to do some simple checking on an organization yourself, you need to know a few key things to look for. Let’s open up the 990 and take a look. But first, what is a 990? A 990 is an annual disclosure form that all non-profits (with the exception of churches) must file with the IRS. In a nutshell, this provides the IRS with information about the organization’s activities: what it does, how it is funded, and how and who governs it. All 990s must also be available to the general public. Anyone can easily look up any organization’s 990 via websites managed by Charity Navigator, Guidestar, or the Foundation Center (as of this month, Guidestar and Foundation Center are merging to form a Candid). Some, though not all, non-profit organizations also include their recent 990s via their own institutional website. The first page of every 990 includes the organization’s basics: the number of employee and volunteers, general sources of revenue and expenses, and total assets and liabilities. While many 990s are inches thick, much can be gleaned from that first page alone. Let’s look at some of the details. While these aren’t financial measures, these numbers reveal much. For example, a charity that prides itself on its grassroots organizing would be expected to have a high ratio of volunteers to employees. As an example, look at the box below, taken from the National Rifle Association’s 2016 990. NRA prides itself on its volunteers, and the numbers back it up. There of course is no magic number when it comes to board members, staff, or volunteers. The important takeaway is the comparison between the organization’s rhetoric and reality. It is especially important to compare data over several years. A substantial year-over-year increase in employees may signal that the organization is hiring at an unsustainable rate, whereas a substantial decline could suggest a broader issue that is forcing the charity to reduce staff (or driving them away). Either way, trends in shifting personnel numbers often point to something deeper that is worth better understanding. The summary page of Form 990 lists the following categories of revenue. What sort of revenue mix should we expect to see? That depends, as you might have guessed, on the charity’s structure and purpose. Keep in mind that not all charities have the same mix of revenue; there’s no universal metric that we can use to judge them. For policy groups, most of the revenues will come from direct contributions. For academic institutions or organizations that provide services, programmatic revenue may well outpace contributions. However, it’s certainly useful to compare a charity to itself across time, or to similar charities during the same period. We’ll talk about how to take a deeper dive into the revenue breakdown below. Other expenses (this covers most goods and services – other than fundraising – purchased by the organization, as well as non-staff programmatic costs). What conclusions about an organization can we draw based on the mix of its expenses? As with revenue, we need to understand the nature of the charity, and compare it to similar nonprofits in the same period and itself in previous periods. An organization’s salaries and fundraising expenses often come under close scrutiny: few people want their charitable donations to pay salaries that aren’t necessary to accomplish the organization’s charitable purpose. Remember, though, there are many reasons that certain staff make what they do. Further, in the think tank/policy world, people are the program. Underpaid talent leading a great program will eventually become a program without a leader. As with so many of these numbers, better to benchmark across similar organizations than to take a number at face value. Revenue minus expenses (line 19): Is this negative? While these may be non-profits, the goal isn’t to run a deficit. Strong programs will have revenues outpace expenses, though anomalies certainly happen that require an organization to draw down its reserves. Net assets (line 22): In a traditional balance sheet, you can think of the net assets as the owner’s equity. This is what’s in the bank in reserves. People have varying perspectives on how much in assets an organization should have. A “traditional” human service charity may not have very much in assets at all, while donor-advised funds or organizations with a long time horizon might have more. As we have mentioned, the 990 can run for pages and pages. You’ll find a wealth of information buried in there. Here are a few additional items that could be of interest to you. Government Grants: How much of the revenue actually comes from governmental sources? This little nugget is a big deal for us at DonorsTrust, where we are generally reluctant to grant to groups receiving more than about a quarter of their funding from governmental sources. You can find the breakdown of where the grants come from in Part VIII. Divide that number by the Total Revenue line (line 12 in that part) and you’ll find the percentage of government money funding the organization. Board Members and Compensation: If compensation levels for senior staff or the make-up of the board of directors matters to you, flip to Part VII. Here you’ll find a list of all the organization’s officers and each’s compensation, along with a list of the highest paid staff who are not officers. Fundraising Expense: Some people worry about how much an organization spends on fundraising. There is no magic number of how much an organization should spend to raise funds, though a range of 20-30% is generally regarded as typical. To understand how much an organization spends on its fundraising, look at Part IX, which breaks up Functional Expenses into programmatic, management, and fundraising costs. Follow the fundraising column down to see staff, material, and contractor expenses as they related to raising the operational budget for the organization. 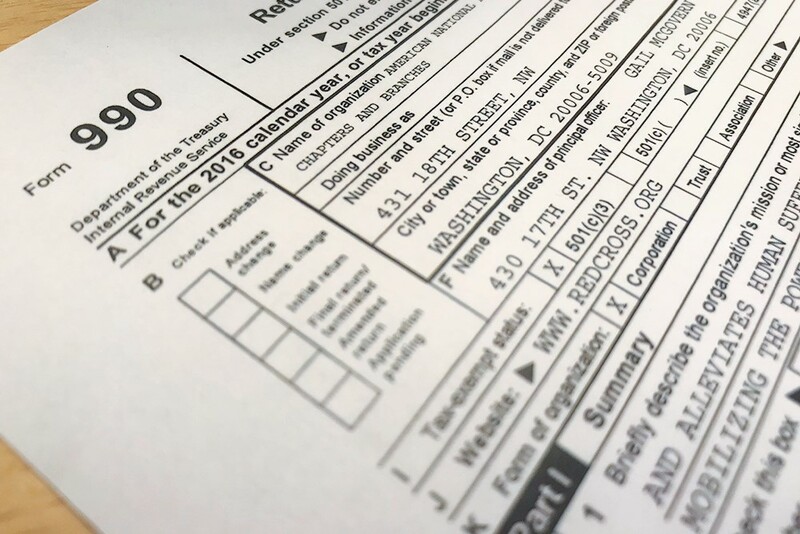 The Form 990 offers more data than you probably care to study – but also information that is extremely valuable. What we have discussed above is intended to show you how to glean basic information about any organizations general health. Ultimately, a 990 doesn’t contain definitive answers for whether an organization is worthy of your charitable dollars. While it does reveal the truth about expenses and revenues, such information is useless unless you know what to look for and what you want to get out of your giving. Working with a mission-driven donor-advised fund helps streamline your information gathering. Since we at DonorsTrust already do the due diligence to flag potential issues and to void your giving to organizations that may run counter to your goals, you free yourself up to focus on what really matters – committing your charitable dollars to achieve the change you want to see in the world.